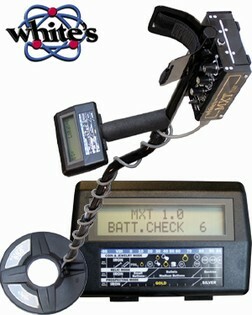 The White’s MXT is a simplified version based on DFX technology, with three different meter displays depending on which mode you are using, Coin & Jewellery, Relic or Prospecting. The MXT is easy to operate with all of the features you may need to locate coins, jewellery and relics. On top of this the MXT has the ground cancelling capability to automatically eliminate heavy ground mineralization. 3 Completely separate programmes operating at 14 kHz ­ Coin & jewellery, relic & prospecting. Unique target responses, display information and audio frequencies. Optional search and discriminate methods like discriminate notch, mixed mode audio, VCO audio and more. Auto ground balance goes easily from mountain minerals to salt water. Boxed MXT , INCLUDES SCUFF COVER!